Fab battery, Delivery service second to none. Clear specification on the site matched requirement exactly, including stop-start function, which had rarely worked for years even after fully recharging the old battery, also a Varta but at least 8 years old. "Eco" system returned immediately after installation. Dispatch and tracking information plentiful and very useful. Also recommendation of garage to fit the battery (AutoPics, Rustington) - excellent & polite service. Thanks Tayna for your organisation. Battery was exactly what was required and even the stop start has begun working again. High quality battery, arrived well packaged and fully charged. Vehicle now running smoothly once again. Battery was a perfect fit. Very fast delivery and fully charged and ready to go. I fitted it the same day and every thing is as it should be. Just bought a Mercedes C180 CGI fitted with its original Varta battery. The original battery had a stamp on the neg terminal of 24/10 so I reckoned it was time to replace it. The service from Tayna was 1st class with a next day delivery from date of order. Although my car does not support stop/start the battery fitted was the stop/start type so the F21 was a direct replacement. Interestingly virtually every battery supplier, including Tayna, matches a different type of battery to my registration so make sure that you order the correct replacement. Excellent Battery and speedy delivery! Returning customer, always use Tayna for my battery needs - 3 caravan leisure batteries and two car batteries. This Varta replaces the original start/stop Varta in my Mercedes which is over 8 years old so I am expecting the same longevity. Fitted to a merc e350 arrived quickly fully charged. Does what it says on the tin, lets see how it performs long term. Despite everyone's web site saying that the only battery for my mercedes was an AGM019 I knew that it would not fit . 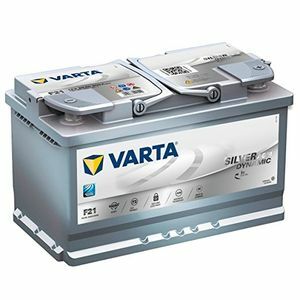 The Varta is a direct replacement for the orriginal Mercedes battery. It arrived within 24 hrs and was expertly packed. Overall a very good service. Exact replacement for factory fitted battery. Well packed and delivered in less than 24 hours from ordering. Excellent service. After a small hiccup when the first battery they sent was low voltage. The replacement however was good, fitted easily into my Merc and seems to be doing it’s job well. This is the time of year that tests battery to the full and this Varta operates well and as I have Start/Stop this is more demanding usage. I thought TAYNA had good communication with me and prompt service, so overal would recommend. Brilliant service, Tried a number of companies and this is the only company that asked me the right questions and supplied me with a better battery than I would have purchased elsewhere. Kai's knowledge & service was excellent. Thank you. Great price and arrived next day. Top service. Competitive price and prompt next day delivery.